“Perfect Chili” … that’s a pretty bold claim. But it’s one I have absolute confidence in. 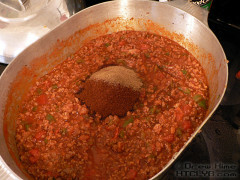 I started making chili when I worked at a restaurant in college. 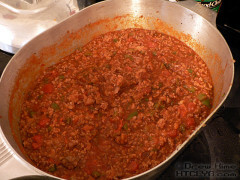 The recipe started with 20 pounds of ground beef and 4 gallons of tomatoes. And a really big pot. Every couple of weeks when I made it I’d refine the recipe a little more. Until finally, I thought it was perfect. Then I tried to make it at home. My “perfect” recipe called for several pounds of chili powder. How many cups was that? I had no idea. So I had to start all over building a new recipe. But I couldn’t serve my family chili very often, so it took me years. And finally, I had a breakthrough. 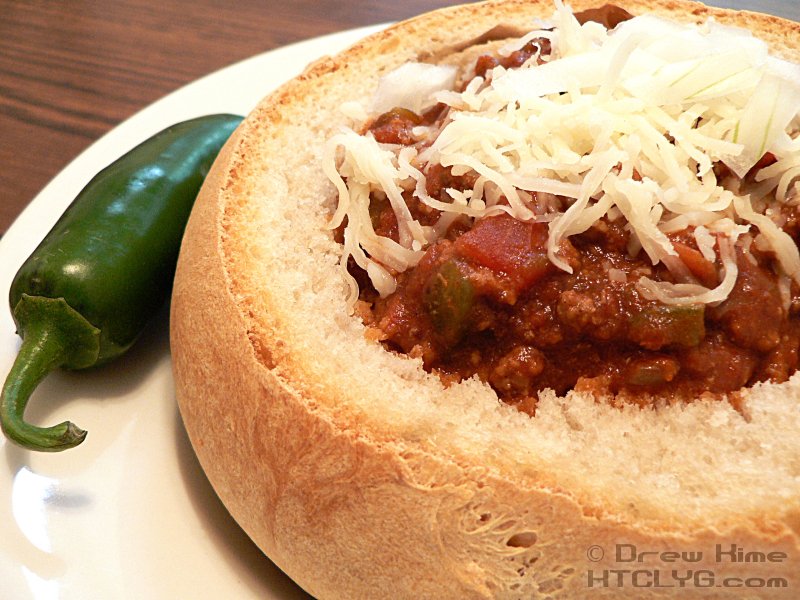 The perfect chili … is different every time. Chili for nachos is different from chili for hot dogs. Chili for me is different from chili for us. “Perfect” chili is whatever you think it is. Chili is actually a great way to clear out the fridge. If you’ve got some veggies that are a little too soft for a salad, throw them in. I won’t go buy mushrooms just to make chili, but if I’ve got some leftovers I’ll use them. I’ve also tossed in carrots and even potatoes. This day what I had left over was ground turkey. Normally I use all ground beef, but why not? Making things the same way every time is boring. Since half of my ground beef was packed flat, it thawed really quickly. 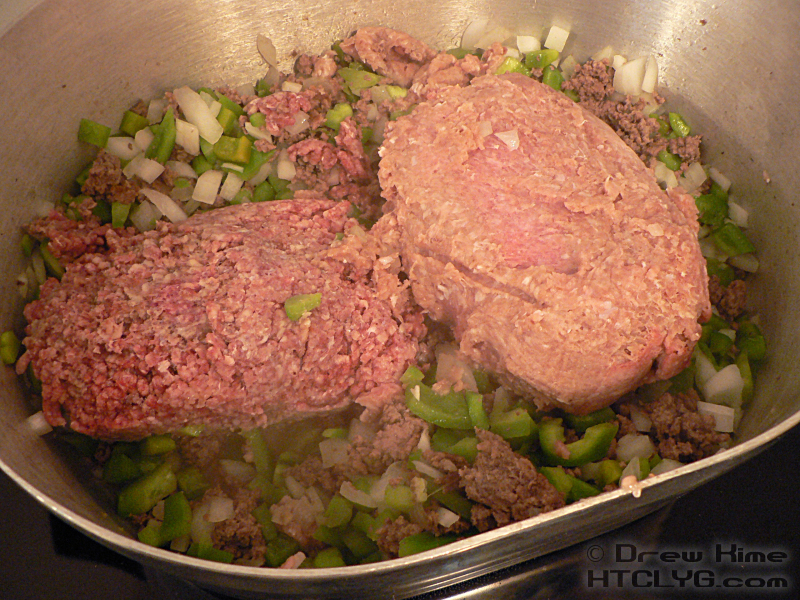 The other pound of ground beef, and all the turkey, was still in a roundish lump. So they were still cold in the center. Not a problem. It’s better to start with just some of the meat anyway. 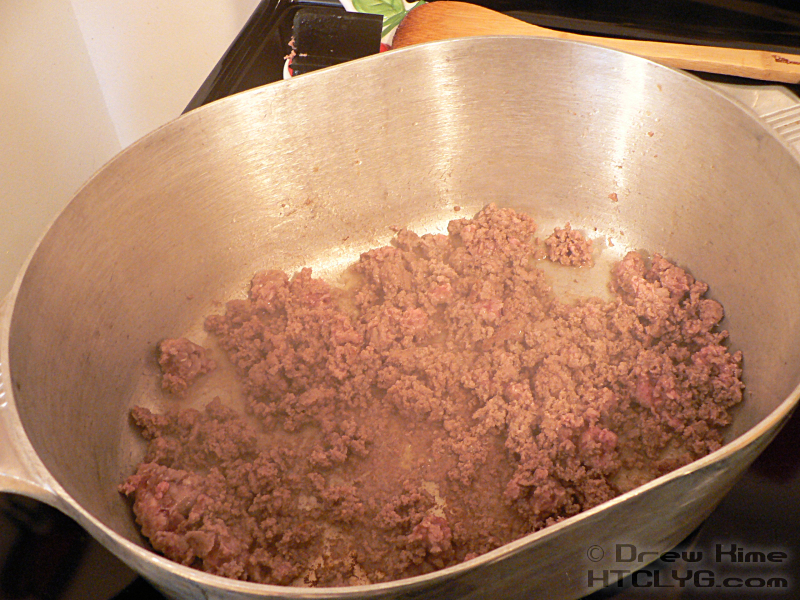 Brown one pound of ground beef over high heat and crumble it up. 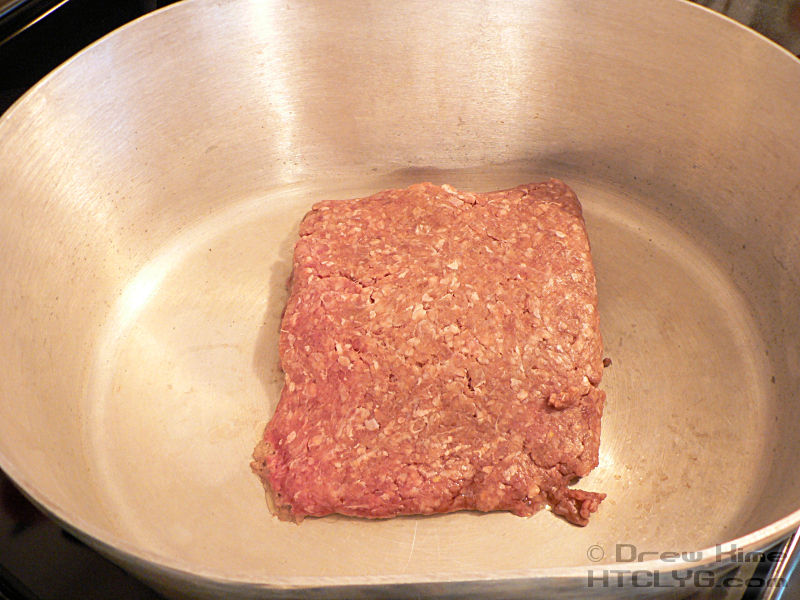 Ground beef will have enough fat in it that you don’t need to add any oil to the pan. Don’t worry about some of it getting burned on, the tomatoes will pick up all the brown bits later. Add a couple teaspoons of salt. Dice half the onion and add it to the ground beef. Dice the peppers, add to the ground beef and onion, and stir. 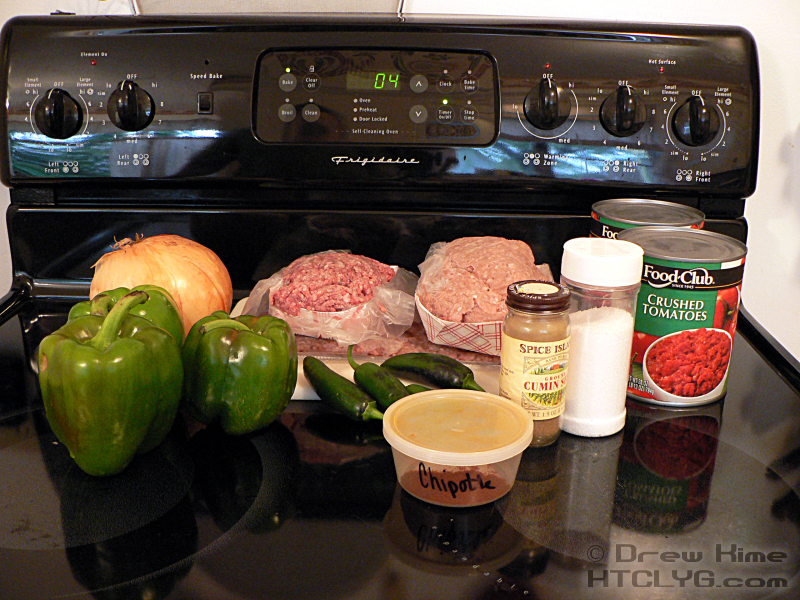 Sometimes I dice the veggies really big and have a chunky, rustic style chili. That’s great for eating by the bowl, but doesn’t work as well on nachos. Since I was doing a big batch, and planned on having leftovers, I went with a smaller dice this time. When making chili for hot dogs, I go extremely small. Dice up whatever other veg you’re adding and toss it in. With all my veg added, I tossed the remaining ground meat in. Yes, they were still frozen in the middle. Put the lid on and, every minute or two, open it up and scrape off whatever meat has thawed. (It took mine about ten minutes to thaw all the way through.) 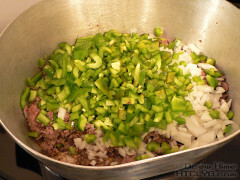 Then crumble up the meat again. 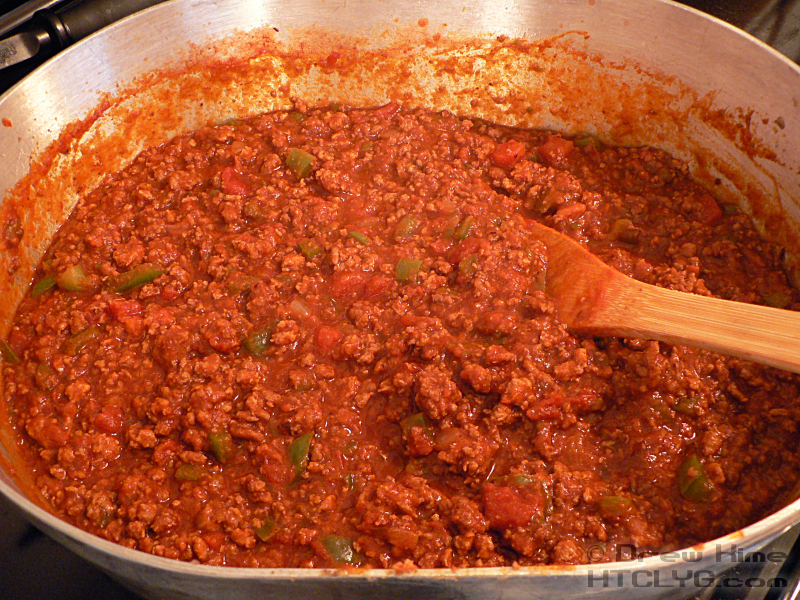 Stir in the crushed tomatoes and turn the heat down low. I’ve done this using fresh tomatoes when I had them available. But most people grow beefsteaks or some other sandwich-friendly variety in their gardens. Romas have better flavor, and that’s what usually goes into canned tomatoes. 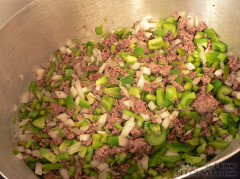 Now add the chile powder and cumin. “Chile” is not a typo. 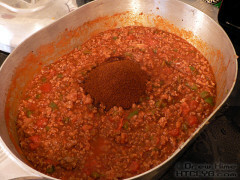 The spicy dish made with ground meat and peppers is called “chili”. The peppers that go in it are “chile” peppers. If you use a pre-mixed blend of chile peppers, garlic, salt and cumin, that is chili powder. If you have the powder of a single kind of pepper that’s chile powder. If there’s a pre-mixed chili powder you like, go ahead and use it. It’s your chili, make what you like. But if you want to control the flavor better, make it more or less hot … more or less sweet … smoky or tart or crisp … you can try out different kinds of chile powder. I used chipotle powder and cumin this time. 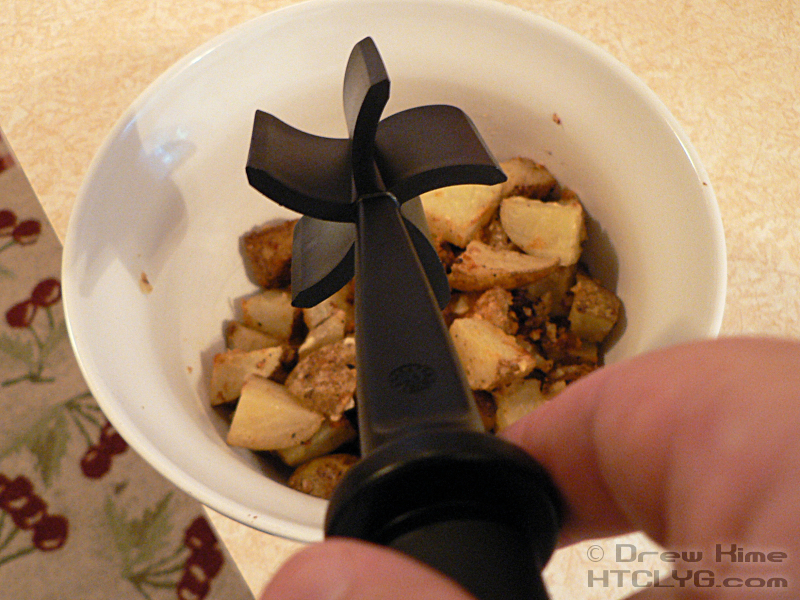 I’ve also done this with ancho powder, which was much milder. Stir your spices in, give it about five minutes to simmer, and taste. This is where you make it your perfect chili. 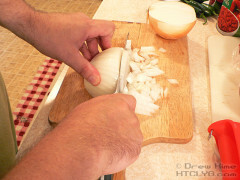 Add more garlic. (Which I did. I completely forgot to add it at the beginning. Oh well.) 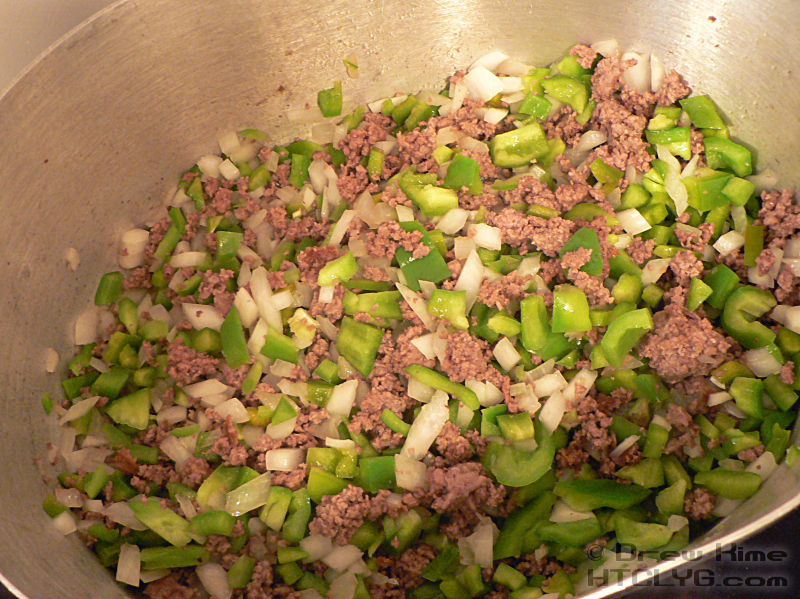 Add salt, Tabasco, diced jalapeños, crushed red pepper, coarse ground black pepper. Whatever you think it needs. 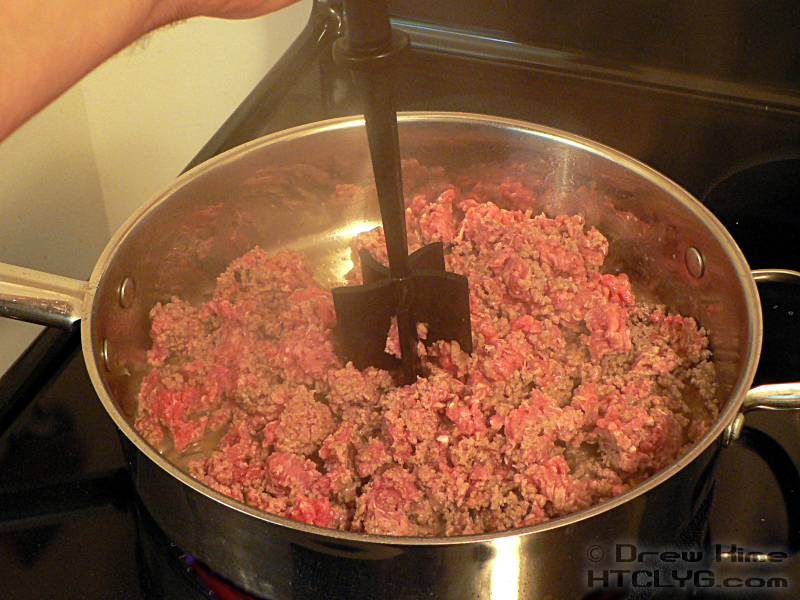 If you’re working with a couple of pounds of meat, like I’ve got here, add spices at least a teaspoon at a time. You won’t notice less than that. 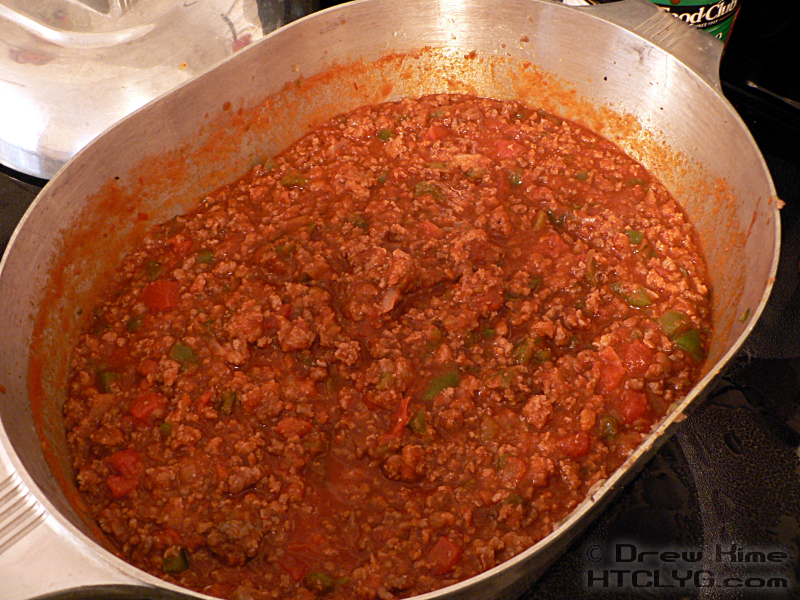 If you used fresh tomatoes or if you added lots of other veggies, you could have a thin, soupy chili at this point. I don’t like my chili thin and soupy. You can stir in a quarter cup of flour or (better) masa and simmer another five minutes to thicken it up. But if you have time, it’s better to simmer it and let it reduce. 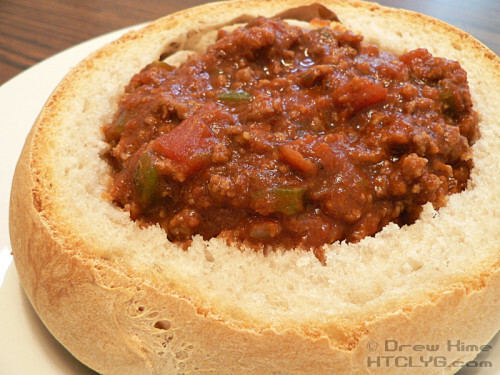 Once you’ve got the right consistency, scoop some out into a sourdough bread bowl. Add some diced onion and shredded cheese. Usually I go for sharp cheddar, but this time I had mozzarella. I think I like it better. Garnish with a fresh jalapeño pepper. If I’ve still got any of this left by Friday, I’ll probably be putting it on nachos. It seems I’ve never posted that, so I’ll take some pictures and put it up. Sign up using the form to the right to make sure you don’t miss it. Brown 1 LB ground beef over high heat and stir to crumble. Dice onion and peppers. 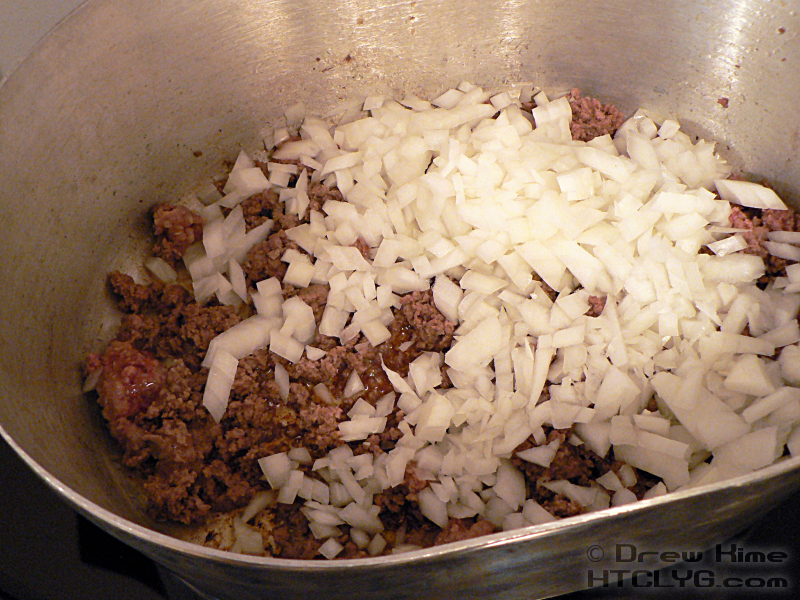 Add ½ the onions and all pepper to ground beef and stir. If you're adding other veggies, dice and add. 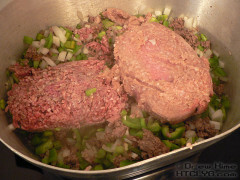 Add remaining ground meat, brown and stir to crumble. Stir in crushed tomatoes and garlic. Turn heat to low. Stir in chile powder and cumin. Let simmer five minutes and taste. 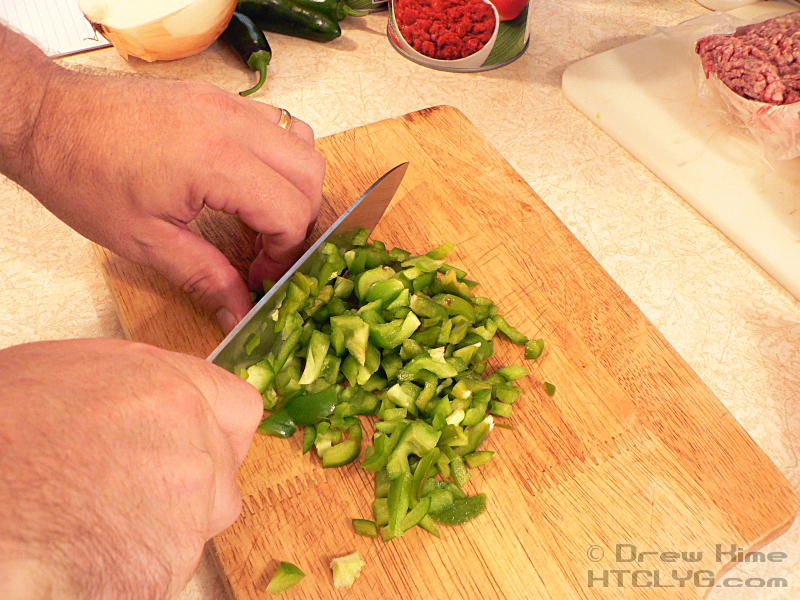 Adjust spices by adding salt, Tabasco, diced jalapenos, crushed red pepper, coarse ground black pepper, etc. Simmer to reduce. If you don't have time to simmer to desired consistency, stir in a quarter cup of masa or flour and simmer another five minutes to thicken. Serve with diced onion and shredded cheese. 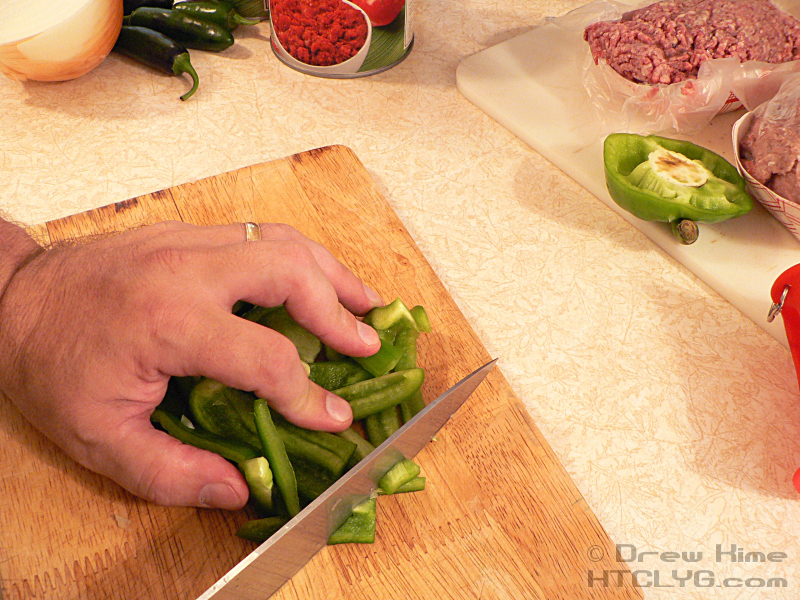 Garnish with a fresh jalapeno pepper.